InDesign Avenger. 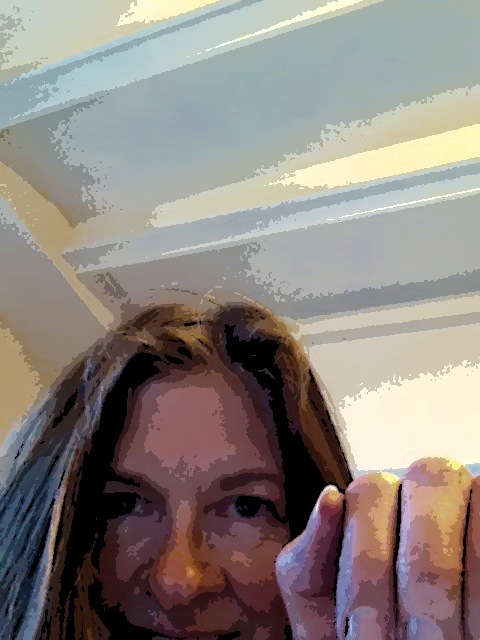 Experimenting with digital software and devices. Learning about WordPress and responsive design. I love living in the future! Building a Brand with InDesign, WordPress, and a Plan. Angie Lokotz has been publishing to paper for over 25 years. That is about to change. This site is meant to be a storefront for people to contact me as well as a forum for my thoughts on publishing. I also envision this as a gateway to offer help to those in the South Sound who have a story to tell, but may not know how to put it together and get it distributed. It is a work in progress and is not yet ready to be unveiled, but the bones are there. I tried to implement the suggestions from the class feedback: The Resources post has moved to its own page. The Resume (About Me) page needs some tweaking, and I need to put up a Samples page with examples of my work and a client list. This entry was posted in Assignment, Projects and tagged Angie Lokotz, digital publishing, InDesign on 17 March 2013 by Angie. It is no secret that I am a fan of Adobe InDesign. Type is my life, and InDesign allows me to control the type. 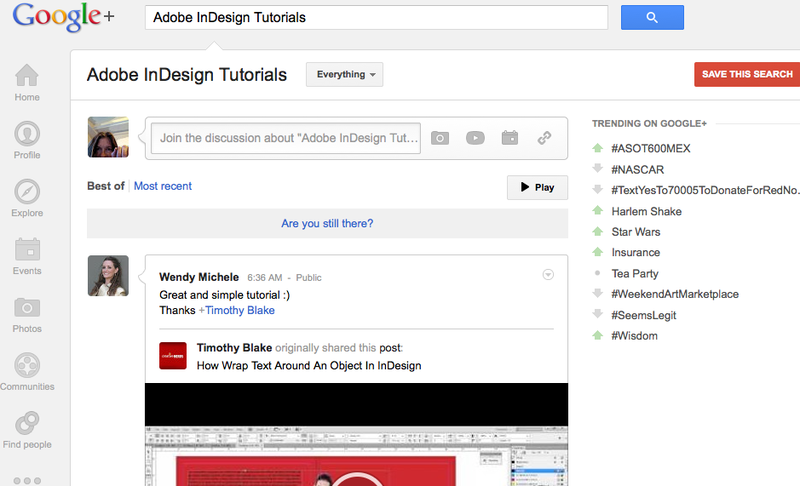 I am always looking for newer, better, more efficient ways to use the software, so as part of the Google+ assignment, I typed “Adobe InDesign Tutorials” into the search field. 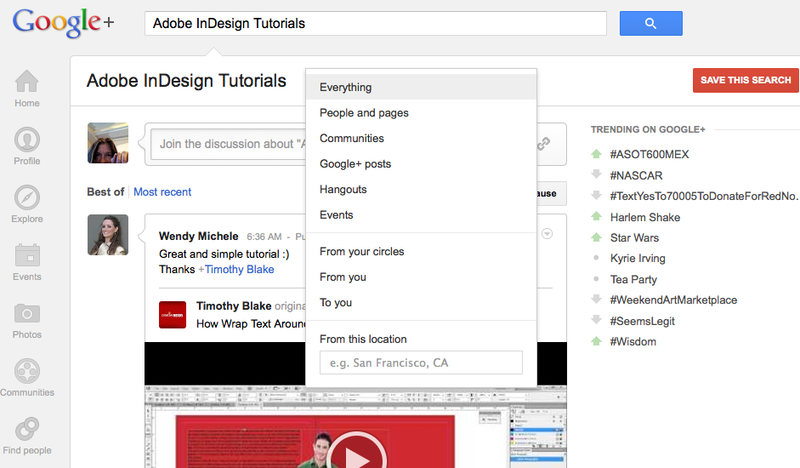 Google+ defaults to “Everything” in its drop down menu. But, wherever there is an arrow, there is a drop down menu, so when you see one, click it. A new world of opportunity will present itself. Various Options Revealed when the “Everything” arrow is clicked. This entry was posted in Resources and tagged follow, Google, InDesign on 16 February 2013 by Angie. OK, I am starting to feel like a social media troll, lurking under the bridge ambushing unaware passers-by. Google+ seems to be another way to ambush “friends” into being social media Plus One’s. I added some family, friends, and co-workers (mostly former), to some eponymous circles, but I did not “follow” them. How do I shed this “Peeping Tom” feeling that accompanies simply being able to “add/follow” without having an approval? This entry was posted in Assignment and tagged Contact, follow, Google on 11 February 2013 by Angie. I made contacts of three individuals: elfelm because he is a great sports/events/music scene photographer, capturing the immediacy of a situation; Sonya Percival because her photos are beautiful, but sad and lonely; and DoreezDad because he takes pictures of Tacoma, the most interesting city I have ever lived in. I like taking pictures with my Android phone. I take pictures of weird things while I am out running or walking the dog. Things like graffiti, snails, murals, mushrooms, couches (I live close to a University and whenever the kids move out, the streets are littered with couches). This entry was posted in Assignment and tagged Flickr, follow, Instagram, Photography on 10 February 2013 by Angie. For those of you who, like me, are still a bit confused with the whole Domain/Sub-Domain/Add-on Domain/Parked Domain thing … How Interactive Technology blog featured a 3-part series of articles by Patrick McNeil about Domains, Domain Names, and Web Hosting. Part 1 discusses how to register a domain. Your domain name can be registered with a different service than your web host (and apparently, if you have many of them, it’s a good idea to gang them at one spot). Part 2 (the more technical part) talks about domain name services (domains, sub-domains, etc. ), the difference between a domain name and a host name, where to point a domain name, etc. And, after reading this, even I think I am starting to understand this stuff. This entry was posted in Resources and tagged DNS, domain names, web hosting on 7 February 2013 by Angie. CreativeLive is a great source for free training in any number of subjects. Erica Gamet is currently teaching an InDesign CS6 Class. Hurry if you want to get in on the action. Course ends Wed., 1/23/13. Classes begin at 9:00 am PST and end at 4:00 pm. There is a chat room where you can post questions. This entry was posted in Resources and tagged CreativeLive, InDesign, InDesign CS6, Photography on 22 January 2013 by Angie. Love the boxed text look. 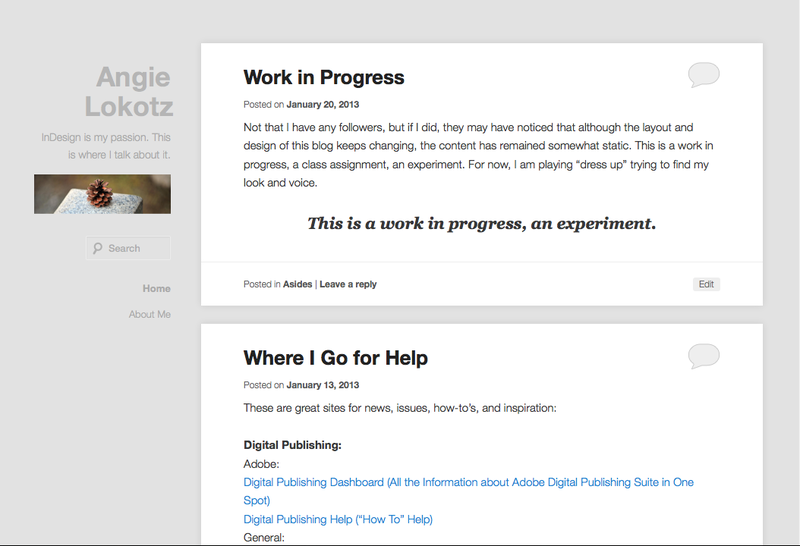 Perhaps when/if this blog goes live I will be looking at customizing (usually that comes with a fee). The theme I go back to all the time is Hum. It is simple and when I view it on the iPad or my Android phone it still looks good. Plus it seems to offer a lot of options to the user even in its basic package. Last week I realized that although my theme looked fine on an Android phone and an iPad, it did not respond to changes in screen size when viewed on a laptop, so I changed it. This entry was posted in Assignment and tagged page layout, responsive themes, wordpress on 20 January 2013 by Angie.